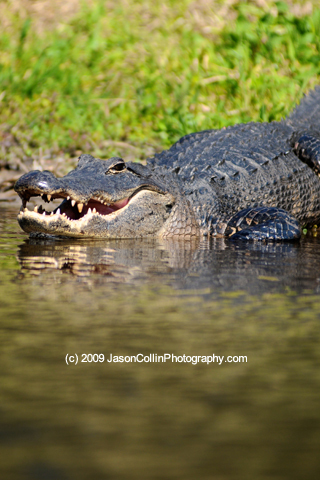 This alligator was photographed in Myakka River State Park. It was the most thrilling photography I have ever made. Why? Because I was in a kayak just a few feet away from this smiling (?) alligator. It was also my very first time to shoot from a kayak and I was quite concerned about dropping my Nikon D300 and Nikkor AF ED 80-200mm F2.8D lens right into the shallow Myakka River. After a short time, however, I was able to develop a technique of paddling toward a subject and then just letting the kayak drift past it while I wielded the D300. I had no idea I had actually gotten so close to the alligator this time though because I was intent on getting the low angle and straight horizon I wanted. As mentioned before, the water was really shallow, which caused a harmless accident a little bit later. This alligator eventually slid into the river and as I paddled to see where she or he had gone off too I actually paddled the kayak right over it! At first I felt great fear as I saw only an alligator leg over the side of the kayak and thought, will it seek revenge? But I never even saw it surface again until I was well far away. I related this story to the kayak rental staff person, and she told me not to worry and that this happens all the time and the alligator was no worse for wear from such an incident. I was relieved.